It was one afternoon in January 2008. Miguel went to his local comic book shop to buy the newest issues of Ultimate Spider-man and Ultimates 3. Then he saw an iconic cover done by one of comics’ biggest artists, Steve Mcniven. It was for Amazing Spider-man #546. The start of the Brand New Day storyline. A few weeks before that, I had just read the conclusion of the One More Day storyline, which ended the marriage of Peter Parker and Mary Jane Watson. 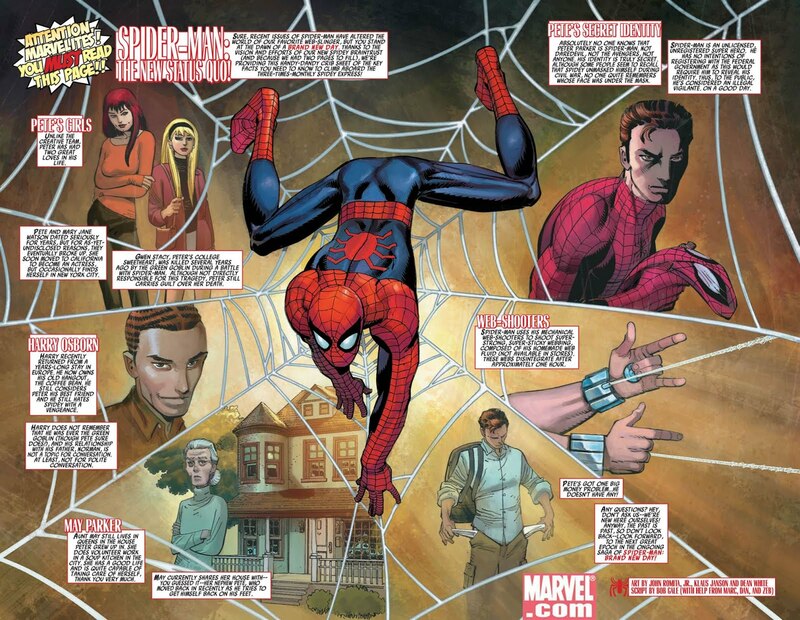 It was also JMS’ final issue on Amazing Spider-man. I admit it: I was a JMS fan growing up. 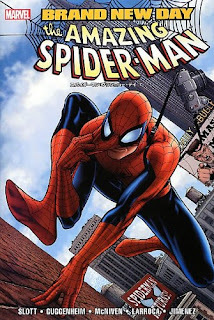 I started reading his Spider-man stories when I was 13 years old and I grew up with it. When his run ended, I had second thoughts on whether I should continue reading Amazing Spider-man or just focus on my favorite Spidey book, Ultimate Spider-man. I wasn’t able to resist the temptation and I quickly bought ASM #546 as well. 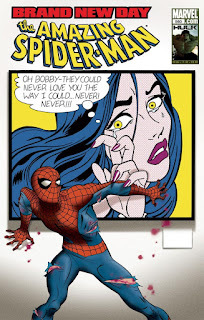 Beginning issue #546, Amazing Spider-man was on sale thrice monthly, meaning 3 issues of Amazing Spider-man in a single month. The other 616 titles like Friendly Neighborhood Spider-man and Sensational Spider-man were cancelled. Along with shipment schedules, Spider-man’s status quo was also changed drastically. Peter was no longer married to Mary Jane. His organic webshooters were gone. The mechanical ones returned. Harry Osborn was resurrected. He was presumed dead but was secretly living in Europe. J. Jonah Jameson had a heart attack and no longer owns the Daily Bugle. Dexter Bennett bought the Daily Bugle and renamed it The DB. Spider-man’s identity is secret once again. The characters Carlie Cooper and Lily Hollister were introduced. Peter is poor once again and no longer lives in Stark tower. The character Jackpot was introduced, who I thought was MJ (but was not). A rotating team of writers and artists were also introduced in the book. The writers were called the “Spidey Braintrust,” and the initial writers were Dan Slott, Marc Guggenheim, Bob Gale and Zeb Wells. I was not a fan of those writers but the artist lineup got me interested. 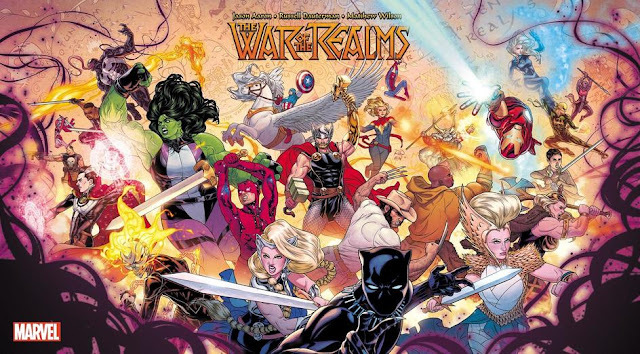 The initial artists were Steve Mcniven, Salvador Larroca, and Chris Bachalo. I gave the first storyarc a try and I liked it. I was not familiar with Dan Slott back then but I found his storyarc with Mister Negative appealing. Steve Mcniven’s art didn’t disappoint, as expected, and I wish he had stayed on the book longer. The problem that I encountered with Brand New Day is that since it had a rotating creative team, the quality was up and down. I was excited with Bob Gale and Phil Jimenez’s initial storyarc but was disappointed after reading it, though Jimenez’s art was terrific. The story didn’t pass my expectations. Later that year, however, other writers joined the creative team. Joe Kelly, Mark Waid and Fred Van Lente joined the braintrust. With the addition of those writers, I think that is where Brand New Day peaked. The team delivered exciting storylines and rocked the status quo even more by introducing J. Jonah Jameson’s father, J. Jonah Jameson Senior. They even got Aunt May and Jameson Sr. tied the knot. They also brought the classic villains back with a vengeance. For me, Brand New Day brought back the word “fun” in Spider-man comics again. With JMS’ run being dark and controversial. Brand New Day went back to the ol’ Spidey stories that we love. Fun, accessible and relatable to readers. The restrictions of the Peter/MJ marriage were gone. Anything goes, and I loved it! It also broke my wallet, but despite that I had no regrets in getting all the issues for that storyline. Looking back on it nine years later, it felt like a homecoming.